- First Thursday of the month from 6.30 pm – 7.30 pm for a light supper. - Third Friday of the month from 7.30 am-8.30 am for a buffet breakfast. We have guest speakers on diverse and interesting topics on the first Thursday of the each month. During one of the meetings we in discuss in addition topics from the monthly Council (that's our word for Committee) Meeting. The club is organised on a committee system and all members are encouraged to join one or more of these and help run the various projects and activities of the club. If meetings of committees are necessary these are often held in the hotel immediately after breakfast and are of short duration so that everyone can be on their way around 9:00am. We can also bring non-Rotarian guests to the club and often do so, especially if we have a particularly interesting guest speaker. Members currently pay an annual subscription of €230 and a contribution of €10 towards the cost of food and refreshments at those meetings which they attend. 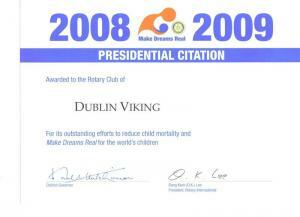 Rotary Dublin Viking achieving Presidential and other citations.